I’ve got a ton of books to tell you about. Seriously, I must have like 10 books to review but what am I doing tonight instead? Oohing over The Journal Junkies Workshop by Eric M. Scott and David R. Modler. I saw this at the bookstore a couple of weeks ago and finally I knew I had to have it so I ordered it. I am pretty good about keeping a journal but my efforts to keep a visual journal are a lot more hit or miss. Because art journaling for me requires more time I tend to put it off and put it off until it becomes harder to get back into it. So I’m always looking for ways to keep inspired and to push on. Once I get going I love it so it’s almost like I need to learn to let go of this feeling that I need to find lots of time to work on my visual journals. We know I complain about not having enough time for reading, bookbinding, etc. so why is this any different? So back to this book. While the book doesn’t necessarily offer many new how-to techniques, it does have some nice step-by-step instructions for the journaler who is just starting out. I have a quite a little library on books on visual arts so a lot of this isn’t new to me, but regardless, I like it because it has artwork that is different from what other books on the subject seem to have and that in itself is what I find inspiring. Here’s hoping I get my mojo back. How about you? Do you keep a journal? Is visual journaling something you like to do too? What a beautiful book! I’ll add this to my list. I’ve journaled – but sporadically – for years. I would really love to start an art journal, though, so this may be the time. I have not been good either. I need to do more. I do better when I do Illustration Friday. Visual journaling is something I love but rarely have time for. I started a visual journal over Christmas break, but haven’t had time to work on it since school started up again. Now I’m thinking of a) ordering this book and b)resuming my visual journal over the summer. My training is in both visual arts and English/writing, so keeping a visual journal seems like a natural for me. I keep a written journal, but inconsistently. I’ve always wanted to try a visual journal, but I did worry it would be too time-consuming. But like you said, we struggle to find time even to read and we do it anyway, right? So it’s got to be worth a try. I have never kept a journal and I honestly don’t know much about visual journalling, but I do scrapbook a lot of my life and I suppose that is similar in a way. jrav – I’ve kept a journal for years too. Visual journaling is pretty new to me as far as practicing it. I hope you check out the book and maybe get inspired to try some visual journaling! Isabel – I think it’s great you can keep up with Illustration Friday. I was doing so well after Journalfest but then this year happened and with all the moving, health issues and stuff, life just got a bit complicated. I feel much more settled now and ready to start! You’ve had a lot going on too but hopefully you can get back into it soon. Lisa Alameda Sumner – You are right, this does seem like it would be a natural step for your journaling! Have you ever seen the magazine Art Journaling by Somerset Studios? You can find it at any bookstore and it’s also very inspiring! Nymeth – I hope you do git it a try! It is so much fun and rewarding. vivienne – Absolutely scrapbooking is very much like visual journaling! I used to scrapbook a lot. I think for me once I went digital with my camera is when I stopped scrapbooking because then I wouldn’t necessarily print out all the pictures! Even if the book doesn’t teach you anything new, sometimes it’s just the inspiration is provides that matters. Have fun! I keep a journal also and for the exact same reasons as you, I keep putting off working in it visually. I have a ton of art supplies in a box but only get it out for the kids to use in their journals. 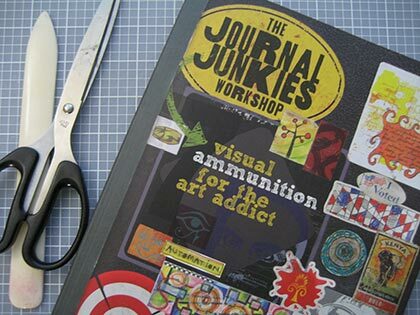 The Journal Junkies Workshop looks great. I have my fingers crossed that my library has it. Happy reading! Stefanie – I agree! It’s inspiring to look at the artwork and then wanting to try a new technique or just go for something similar. That’s a good way to venture out into different forms. Vasilly – I hope your library has it so you can check it out. It’s really fun. Maybe you could do some visual journaling with your kids! I would love to keep a visual journal and I started a doodling journal a while ago, but it fell away. It’s so much fun to just ahve no pressure on how it comes out and what it looks like (unlike an atristic progress sketchbook). Let us know how your efforts go, I know journalling is really private but if you were to show us some snippets I bet we’d all oo and ahh over them. I love the idea of a visual journal! I’m terrible about journaling though. My reading journal is about the only thing I keep up regularly and even then I fall behind sometimes. The journal sounds very nice. I try to keep a journal but I dont keep up with it. I like to jot down any interesting dreams I have in it. I have just discovered the concept of the “visual journal” this past week and I want to investigate it further. If you have the time – and wouldn’t mind – I would love to hear your recommendations of useful book titles that would help this rather uncreative person begin this type of project.